Spawning all the way from Bombay (India), the debut album, “One Last Monsoon,” was written & performed entirely by songwriter David Abraham, and primarily recorded in his bedroom – an apt environment for an album that plays like a love letter to the Indie & Alternative genres, and the artists/bands that allow these genres to thrive. The Koniac Net has been compared to artists such as the Stills, Smashing Pumpkins, Toadies, Death Cab For Cutie, Matt Pond PA, Marcy Playground, and even Chris Isaac . The album not only pays tribute to the genres these artists represent, but at the same time breathes new life into the Indie genre. ‘One Last Monsoon’ is for all intent and purposes a mixed tape for the Indie & Alternative music fan. Songs from the album have already gained airplay on over 80 radio stations across 27 countries. Upon receiving numerous requests to tour internationally, the Koniac Net transformed from a one-man-project to a 5-piece band in June of 2012. 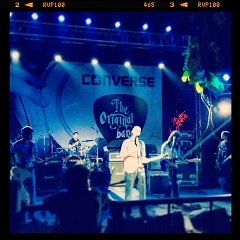 * The Koniac Net was voted as “Best Original Band, Mumbai 2012″ by Converse & Rolling Stone Magazine India. * They received a 10 out of 10 album review rating by Dublin’s (Ireland) U&I Music Magazine: http://issuu.com/uandimusicmagazine/docs/february2013/1 (Page 46). * Was voted as June’s (2012) Artist of the Week by Indie Music Bus, and Band of the Month (May, 2012) by Alternative Addiction.com (both U.S. companies). * The music video for “This Time Around” debuted on MTV (India) in March, 2013.